The pE-2 is a fluorescence LED illumination system which provides repeatable and controllable light with a choice of 20 different LED peaks. It is perfect for the researcher who has a specific set of tests to conduct. The user can specify a wavelength configuration matched to their particular fluorescence requirements. It is modular, allowing LED wavelengths to be exchanged as requirements vary or additional experiments are added. Manual control is via a remote control pod with instant on/off and intensity control from 0-100%. Additionally, the system is fully integrated under many imaging software packages. 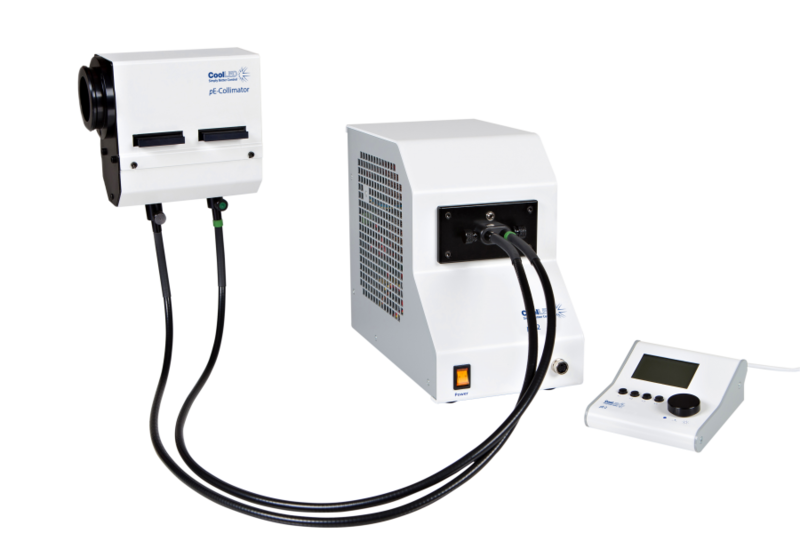 The mercury-free pE-2 LED illumination system is designed for use on most epi-fluorescent microscopes. The output is stable, repeatable and controllable. High intensity light is generated within the pE-2 Light Source and delivered to the microscope via two liquid light guides and a combining collimator. This modular system accepts LAMs (LED Array Modules) selected from CoolLED’s wide range of LED wavelengths. These LAMs can be interchanged by the user so that different LED wavelengths can be illuminated depending on the application. The system can drive up to 4 LED wavelengths.